Светското првенство во фудбал 2018 - нокаут фаза била втората фаза на Светското првенство 2018, после групната фаза. Започнала на 30-ти јуни со осминафиналето а завршила на 15-ти јули со финалниот натпревар, кој се одиграл на стадионот Лужники во Москва. Првопласираните две репрезентации од секоја група (вкупно 16) помиале во нокаут фазата каде ќе се натпреваруваат по систем на елиминација. Исто така, ќе се игра и натпревар за третото место, помеѓу двете репрезентации кој загубиле во полуфиналето. Во нокаут фазата, ако натпреварот заврши нерешено после 90 минути, ќе се игра дополнително време (два пати по 15 минути), каде што секој на тим ќе му биде дозволено да направи четврта замена. Ако резултатот биде нерешен и по продолженијата, натпреварот ќе го одлучат пеналите за да се добие победник. Првите две репрезентации од секоја од осумте групи се квалификувале за нокаут фазата. Главна статија: „Финале на Светското првенство во фудбал 2018“. ↑ "FIFA World Cup Russia 2018 – Match Schedule" (PDF). FIFA.com. Fédération Internationale de Football Association. конс. 20 December 2017. ↑ 2,0 2,1 "Regulations – 2018 FIFA World Cup Russia" (PDF). FIFA.com. Fédération Internationale de Football Association. конс. 16 November 2017. ↑ "Match report – Round of 16 – France v Argentina" (PDF). FIFA.com. Fédération Internationale de Football Association. 30 June 2018. конс. 30 June 2018. ↑ "Match report – Round of 16 – Uruguay v Portugal" (PDF). FIFA.com. Fédération Internationale de Football Association. 30 June 2018. конс. 30 June 2018. ↑ "Uruguay v Portugal – Man of the Match". FIFA.com. Fédération Internationale de Football Association. 30 June 2018. конс. 30 June 2018. ↑ "Match report – Round of 16 – Spain v Russia" (PDF). FIFA.com. Fédération Internationale de Football Association. 1 July 2018. конс. 1 July 2018. ↑ "Spain v Russia – Man of the Match". FIFA.com. Fédération Internationale de Football Association. 1 July 2018. конс. 1 July 2018. ↑ "Match report – Round of 16 – Croatia v Denmark" (PDF). FIFA.com. Fédération Internationale de Football Association. 1 July 2018. конс. 1 July 2018. ↑ "Croatia v Denmark – Man of the Match". FIFA.com. Fédération Internationale de Football Association. 1 July 2018. конс. 1 July 2018. ↑ "Match report – Round of 16 – Brazil v Mexico" (PDF). FIFA.com. Fédération Internationale de Football Association. 2 July 2018. конс. 2 July 2018. ↑ "Brazil v Mexico – Man of the Match". FIFA.com. Fédération Internationale de Football Association. 2 July 2018. конс. 2 July 2018. ↑ "Match report – Round of 16 – Belgium v Japan" (PDF). FIFA.com. Fédération Internationale de Football Association. 2 July 2018. конс. 2 July 2018. ↑ "Belgium v Japan – Man of the Match". FIFA.com. Fédération Internationale de Football Association. 2 July 2018. конс. 2 July 2018. ↑ "Match report – Round of 16 – Sweden v Switzerland" (PDF). FIFA.com. Fédération Internationale de Football Association. 3 July 2018. конс. 3 July 2018. ↑ "Sweden v Switzerland – Man of the Match". FIFA.com. Fédération Internationale de Football Association. 3 July 2018. конс. 3 July 2018. ↑ "Match report – Round of 16 – Colombia v England" (PDF). FIFA.com. Fédération Internationale de Football Association. 3 July 2018. конс. 3 July 2018. ↑ "Colombia v England – Man of the Match". FIFA.com. Fédération Internationale de Football Association. 3 July 2018. конс. 3 July 2018. ↑ "Match report – Quarter-final – Uruguay v France" (PDF). FIFA.com. Fédération Internationale de Football Association. 6 July 2018. конс. 6 July 2018. ↑ "Uruguay v France – Man of the Match". FIFA.com. Fédération Internationale de Football Association. 6 July 2018. конс. 6 July 2018. ↑ "Match report – Quarter-final – Brazil v Belgium" (PDF). FIFA.com. Fédération Internationale de Football Association. 6 July 2018. конс. 6 July 2018. ↑ "Brazil v Belgium – Man of the Match". FIFA.com. Fédération Internationale de Football Association. 6 July 2018. конс. 6 July 2018. ↑ "Match report – Quarter-final – Sweden v England" (PDF). FIFA.com. Fédération Internationale de Football Association. 7 July 2018. конс. 7 July 2018. ↑ "Sweden v England – Man of the Match". FIFA.com. Fédération Internationale de Football Association. 7 July 2018. конс. 7 July 2018. ↑ "Match report – Quarter-final – Russia v Croatia" (PDF). FIFA.com. Fédération Internationale de Football Association. 7 July 2018. конс. 7 July 2018. ↑ "Russia v Croatia – Man of the Match". FIFA.com. Fédération Internationale de Football Association. 7 July 2018. конс. 7 July 2018. ↑ "Match report – Semi-final – France v Belgium" (PDF). FIFA.com. Fédération Internationale de Football Association. 10 July 2018. конс. 10 July 2018. ↑ "France v Belgium – Man of the Match". FIFA.com. Fédération Internationale de Football Association. 10 July 2018. конс. 10 July 2018. ↑ "Match report – Semi-final – Croatia v England" (PDF). FIFA.com. Fédération Internationale de Football Association. 11 July 2018. конс. 11 July 2018. ↑ "Croatia v England – Man of the Match". FIFA.com. Fédération Internationale de Football Association. 11 July 2018. конс. 11 July 2018. ↑ "Match report – Play-off for third place – Belgium v England" (PDF). FIFA.com. Fédération Internationale de Football Association. 14 July 2018. конс. 14 July 2018. ↑ "Belgium v England – Man of the Match". FIFA.com. Fédération Internationale de Football Association. 14 July 2018. конс. 14 July 2018. 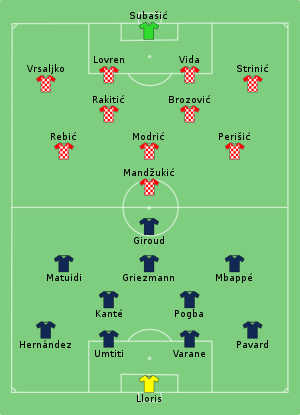 ↑ "Match report – Final – France v Croatia" (PDF). FIFA. 15 July 2018. конс. 15 July 2018. ↑ "France v Croatia – Man of the Match". FIFA.com. Fédération Internationale de Football Association. 15 July 2018. конс. 15 July 2018. Последната промена на страницава е извршена на 14 јануари 2019 г. во 17:03 ч.